Did Megafauna die from hunting or climate change? Lightest alcohol stove for hiking - and the easiest to make! 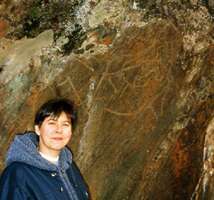 Paisley Caves complex - when did people first reach North America? Solvieux - a large open-air site near Gabillou in the l'Isle basin. Szeletian culture - a development of the Mousterian, contemporaneous with the Aurignacian. 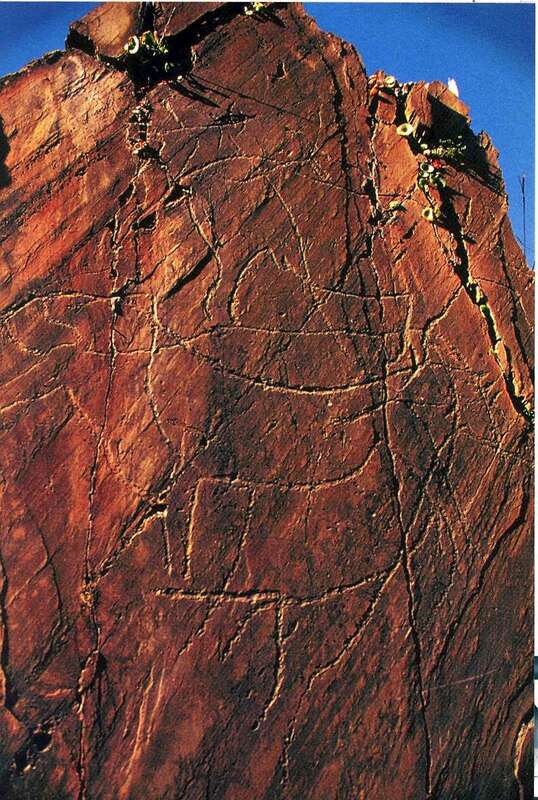 The Coa Valley has the most exceptional concentration of rock carvings from the Upper Palaeolithic. 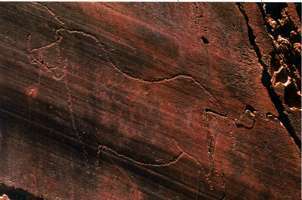 It is the most outstanding example of early human artistic activity in this form anywhere in the world, and has been designated a UNESCO world heritage site. 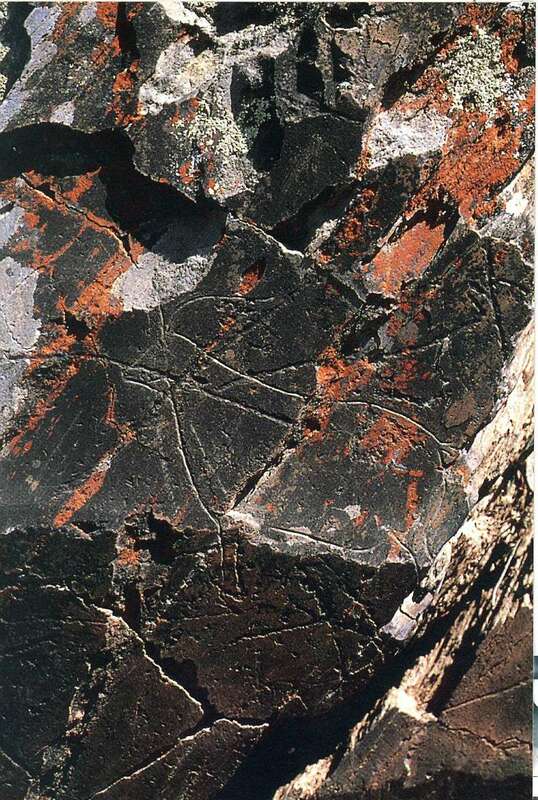 It should be noted at the outset that the Coa Valley rock art has consistently been dated at older than 20 000 years by those relying on stylistic evidence. It has been categorised as Solutrean in style. Others have disputed such an early date. 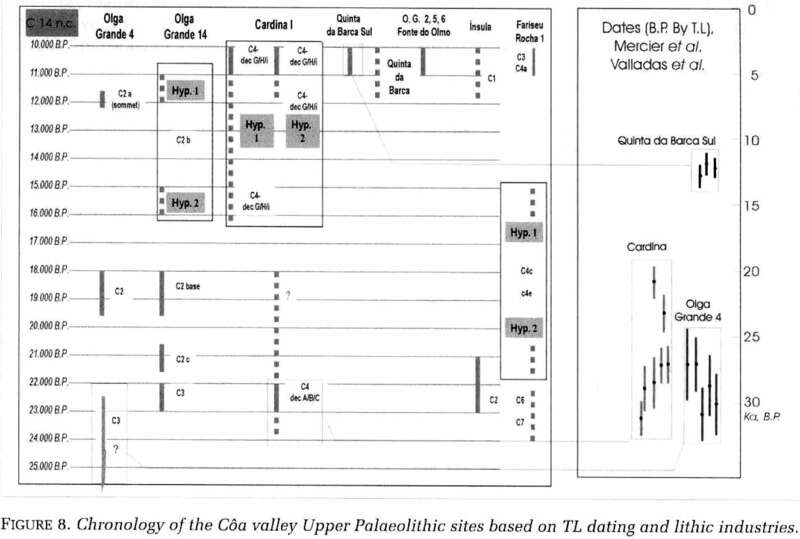 A 2002 paper, Open-air Rock-art, territories and modes of exploitation during the Upper Palaeolithic in the Coa Valley (Portugal), by Thierry Aubry, Xavier Mangado Llach, Jorge David Sampaio, Farid Sellami has settled the chronology in the favour of the 10 000 to 30 000 BP time frame, see the figure below. 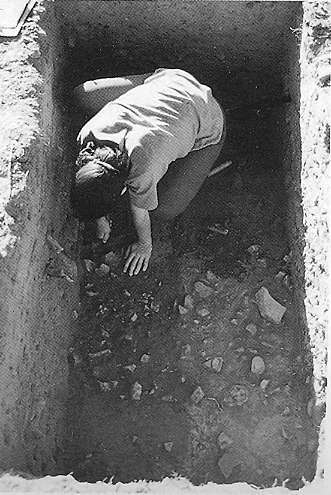 In 1989, E.D.P. 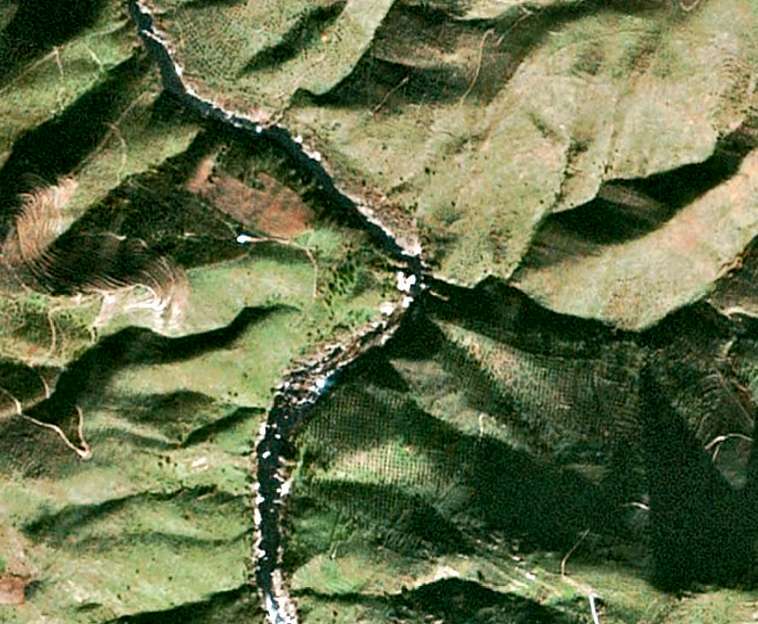 (Electricidade de Portugal) ordered an Environmental Impact Study to be carried out in the Coa valley, in preparation for the construction of a large dam to be located near the mouth of the river. 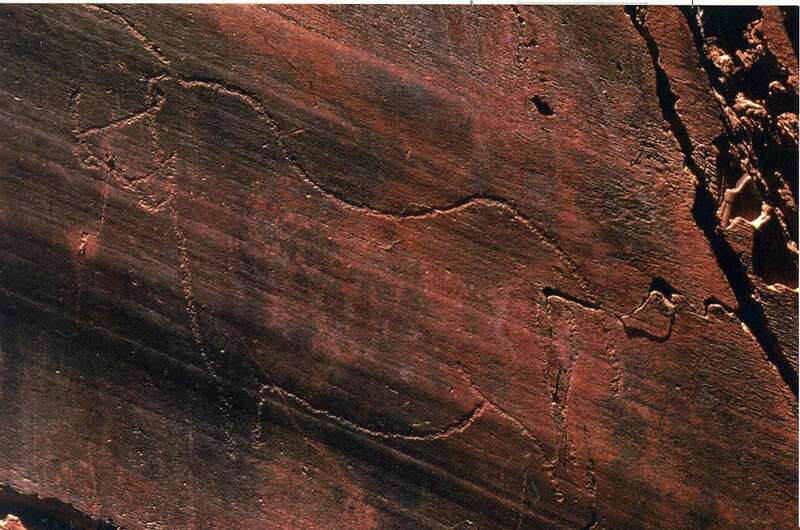 In the framework of that study, a team of archaeologists made a preliminary survey of the area to record and evaluate the cultural heritage items that would be submerged or destroyed as a result of the construction of the dam. 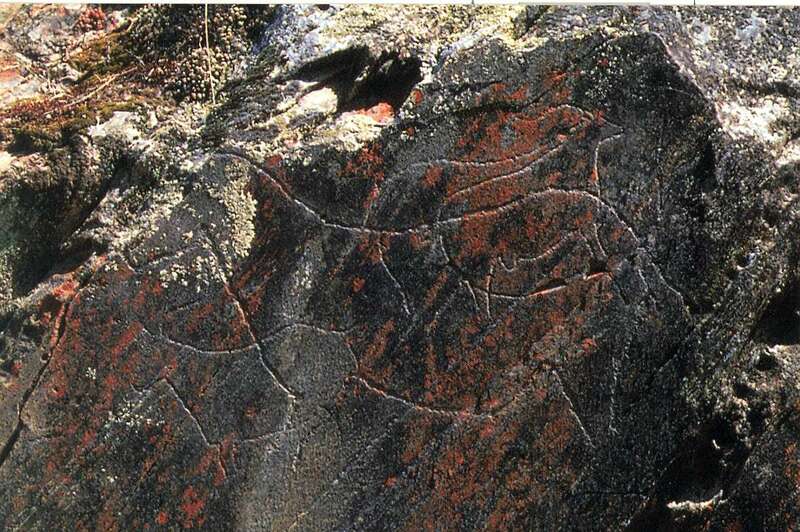 An important array of archaeological sites was identified, including four rock-shelters with prehistoric paintings. Map: Arte Rupestre e Pré-História do Vale do Coa trabalhos de 1995-1996,Coordenaçâo de Joâo Zilhão, Ministério da Cultura, Portugal, 1997. 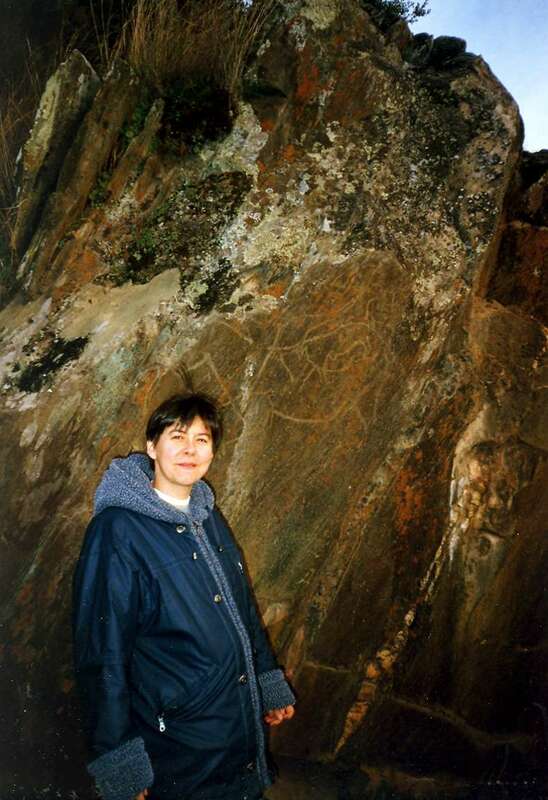 This is a good photo to show the scale of some of the engravings. 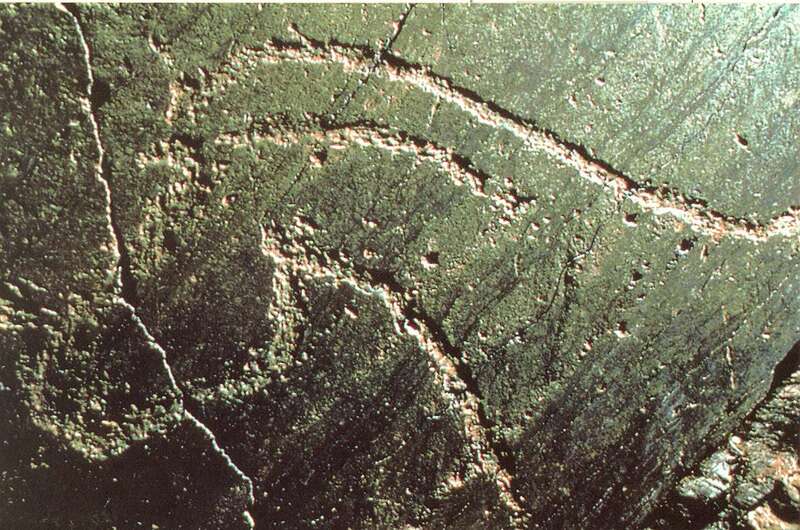 Passionate controversy immediately followed the public announcement of the existence of this soon-to-disappear complex of rock art sites. Massive national and international protest - conducted under the slogan Petroglyphs can't swim, derived, from a popular rap song, by the high-school students from the local town of Vila Nova de Foz Coa - eventually forced the Portuguese government to slow down construction work, which almost came to a halt in May 1995. 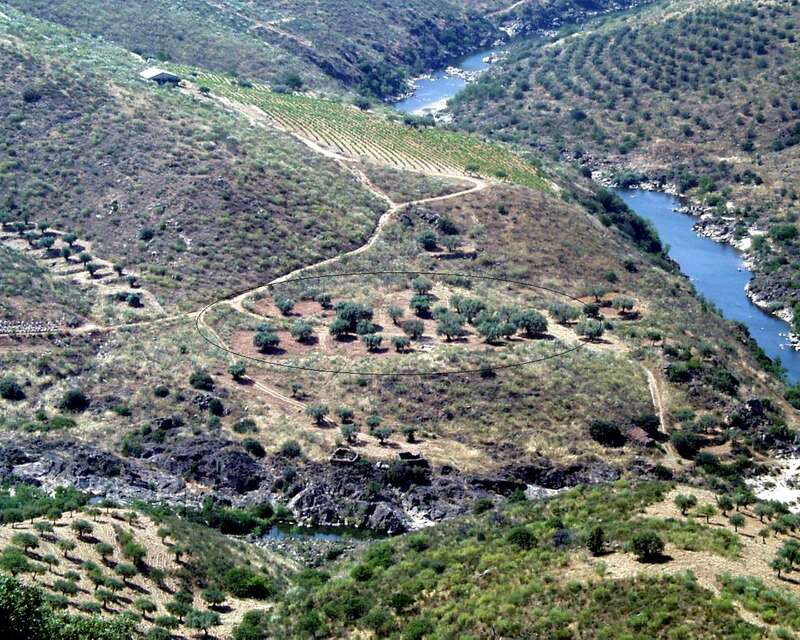 In November 1995, recognising the importance of the cultural heritage of the region, the Portuguese government decided to halt the construction of the dam and to integrate this ensemble of finds into a Coa Valley Archaeological Park. 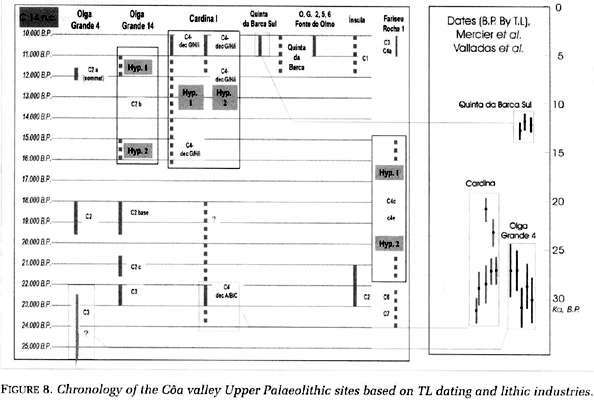 Chronology of several sites in the Coa Valley region. 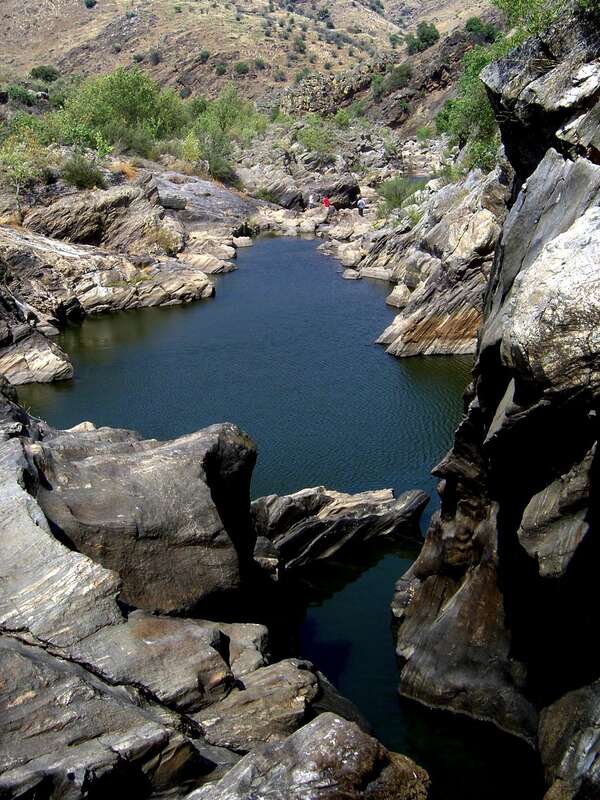 Salto do Boi, Cardina I. A general view from the SW to the NE. 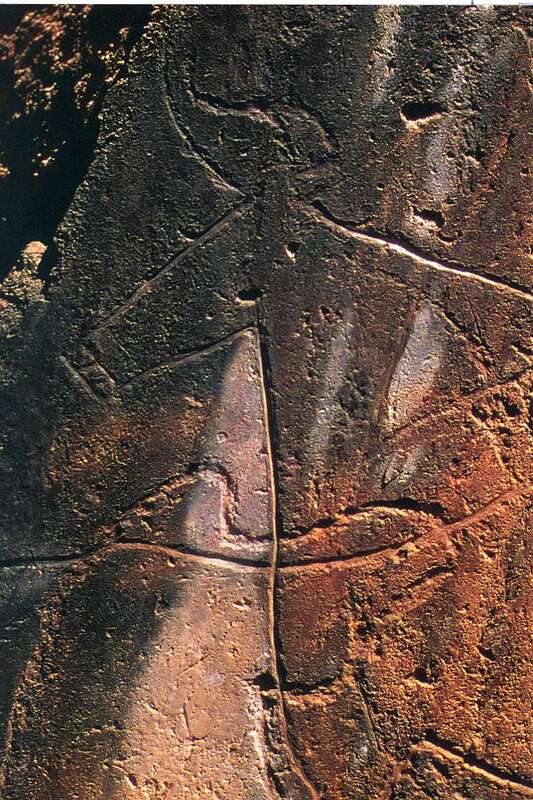 The arrow indicates the position of the jazida or archaeological dig. 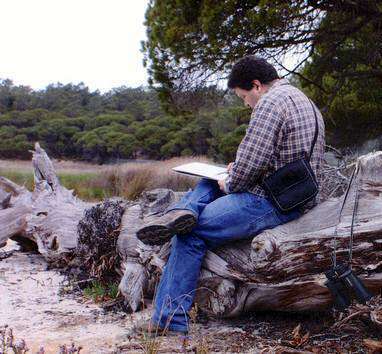 Photo: Arte Rupestre e Pré-História do Vale do Coa trabalhos de 1995-1996,Coordenaçâo de Joâo Zilhão, Ministério da Cultura, Portugal, 1997. Careful plans and records are made when a dig of this significance is made. 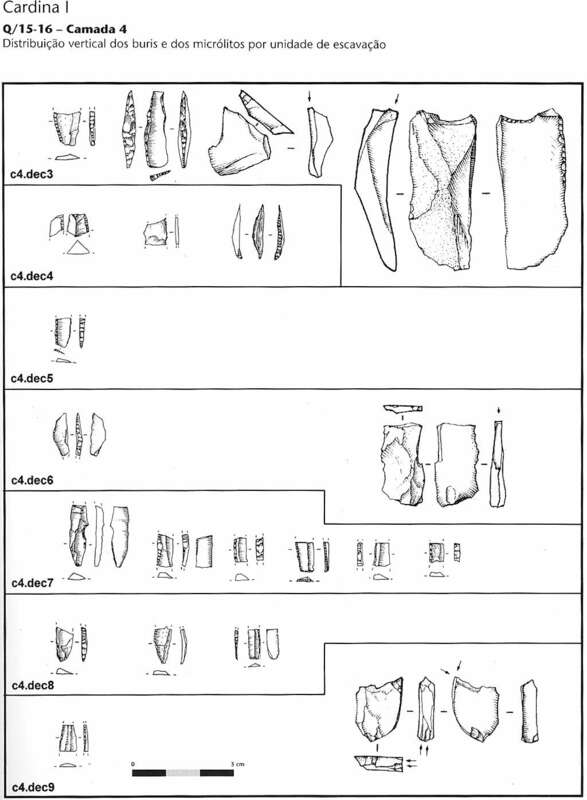 Drawings of artefacts found at Cardina I at Salto do Boi from squares Q/15 - 16. 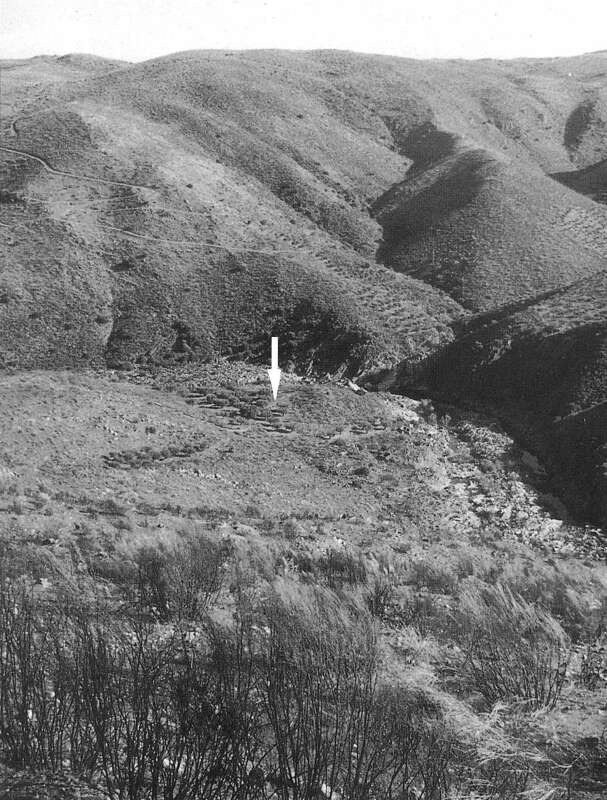 The site is on a shelf, a flat area ideal for a camp, in the inside of a right angled bend in the Coa River. Archaeology students investigating the site shown in the long distance shot above. 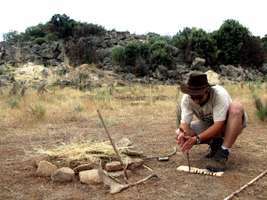 Recreation of an encampment of the people of the Coa Valley at the Cardina I site. 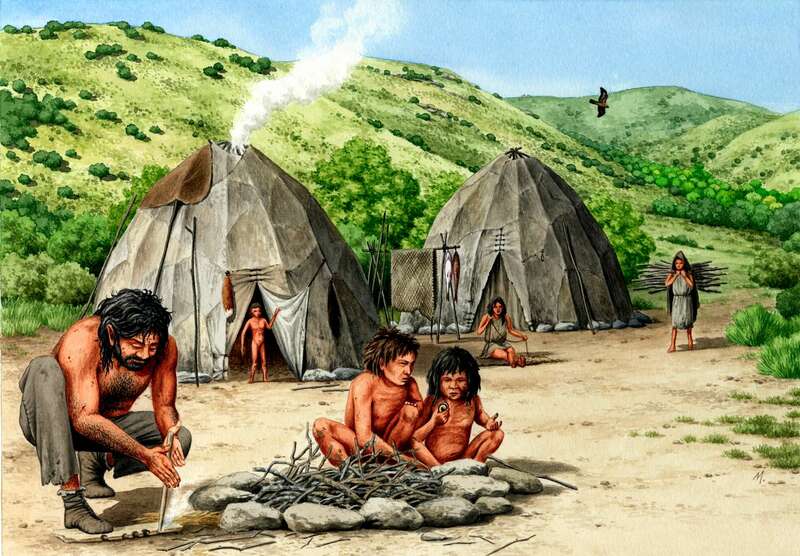 Marcos Oliveira has used photographs of the area and information from scientific investigations to recreate much of the daily lives of the people who lived here in the late Palaeolithic. 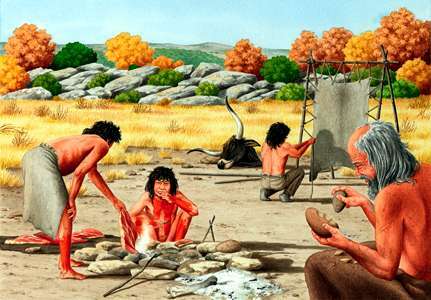 This painting illustrates the Cardina I site shown in the photographs above where the remains of two huts with fireplaces were found. The shape of the tents and their construction using saplings covered in hides were suggested to Mr Oliveira by the french archaeologist Thierry Aubry, who works in the Park (Parque Arqueológico do Vale do Coa - PAVC) as a result of his extensive knowledge of the digs in the area. As might be expected, the Palaeolithic peoples of the Coa Valley chose flat, relatively extensive areas close to the river for their dwelling sites. Starting a fire the old fashioned way, to use as the basis of the painting above. Right: the same photo flipped. This method allows the artist to create very realistic paintings, with natural poses. 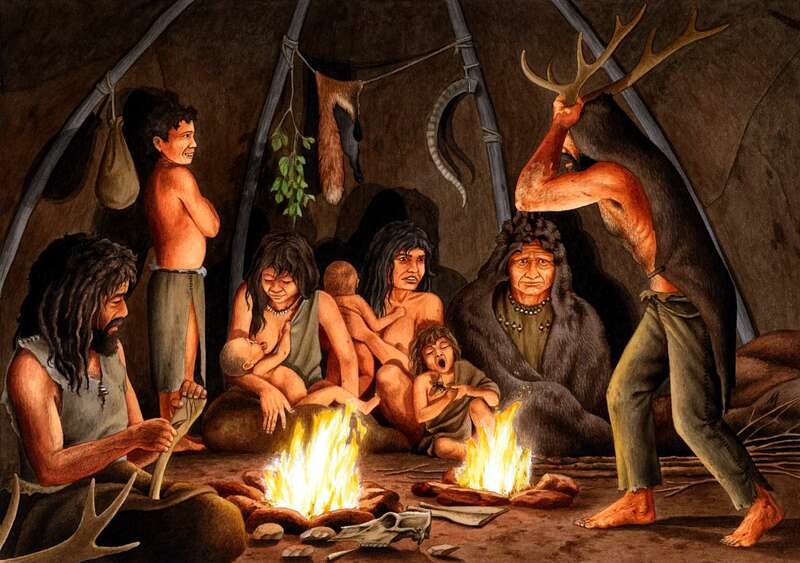 A superb recreation of a night time scene inside of one of the tents, showing a shaman or a story teller with a family by firelight. The Coa River is a tributary of the Douro, the major river draining the northern slope of the central Iberian Cordillera. 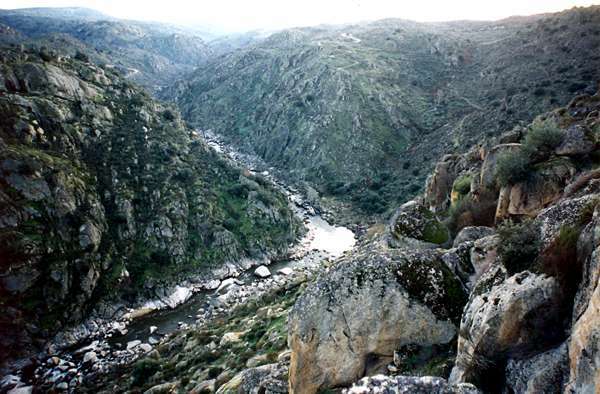 The river is 120 km long, and from the source to within 17 km of its confluence with the Douro, it has a narrow valley flowing through granitic rocks. The river then enters a zone of metamorphic rocks, and flows through a broader valley as it meanders to its meeting with the Douro. The basin covers 2419 km2, and the average precipitation is 818 mm in the middle of the basin, but in the last part of the valley, below 150 m, precipitation is less than 300mm, giving a relatively arid environment. Winter temperatures drop as low as 5° in winter, rising to more than 35° in July and August. 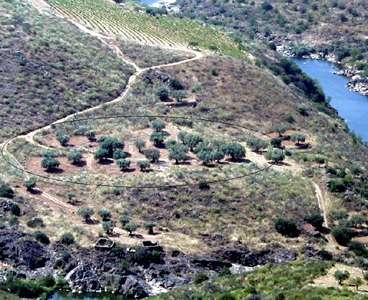 Because of this environment, and because the soils are thin and ill suited for agriculture, mainly vines, olive and almond trees are grown in terrace cultivation, with supporting walls of low dry stone walls, to preserve the soils. Sheep and goats are also raised in the region. By Thierry Aubry, Xavier Mangado Llach, Jorge David Sampaio, Farid Sellami. Recreation of life in the Coa Valley, based on the photograph of the river gorge above. 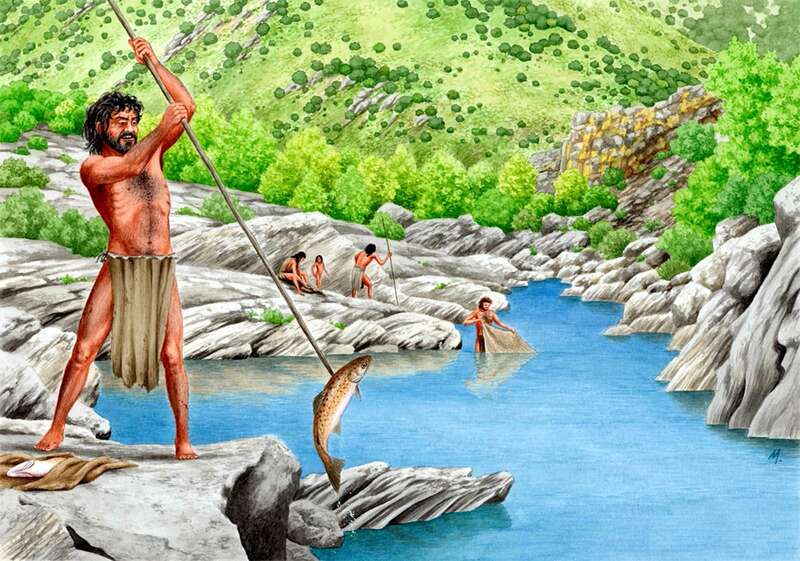 The man has just speared a salmon or trout (they belong to the same family, the salmonids) in the water, while another fisherman tries a net in the shallows. 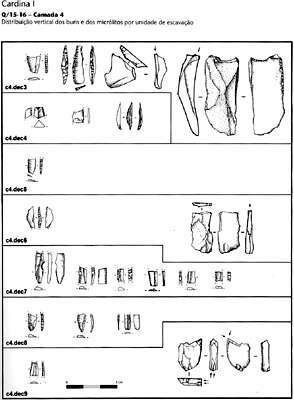 The PAVC have identified bones of the Allis Shad, Alosa alosa of the family Clupeidae in the area, associated with Palaeolithic artefacts. 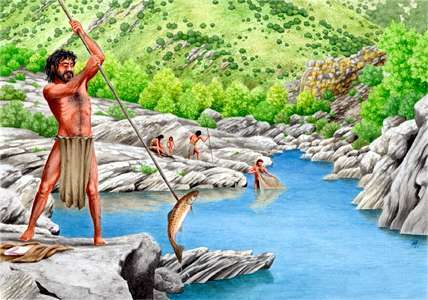 Today there are brown trout in the river, but migratory large trout such as the sea trout are absent because of the many dams between the sea and this region. 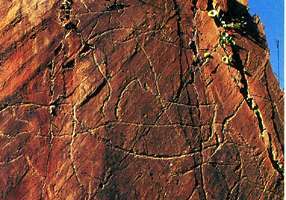 The archaeological site of the Salto do Boi is located on the left bank of the river Coa, about 500 m downstream from the mouth of the river Massueime, and is located about 3 kilometers upstream of the cores of rock carvings and engravings of Penascosa Quinta da Barca. 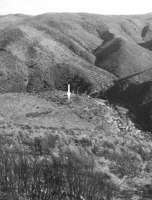 The land in question, known locally as Cardina, is the property of sr. Fernando Augusto Baltazar, residing in the village of Melhor. 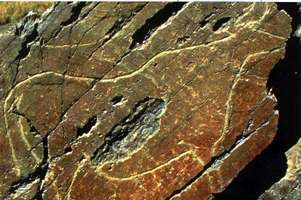 They were identified and subjected to archaeological survey two distinct areas: Cardina I and II. 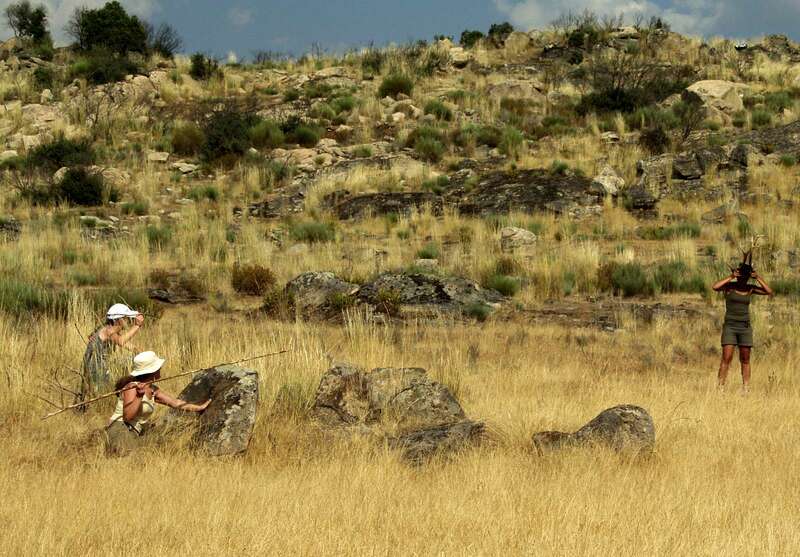 They are flat platforms, the first at a height of of about 25 m above the bottom of the valley and the second about 10 m below that. 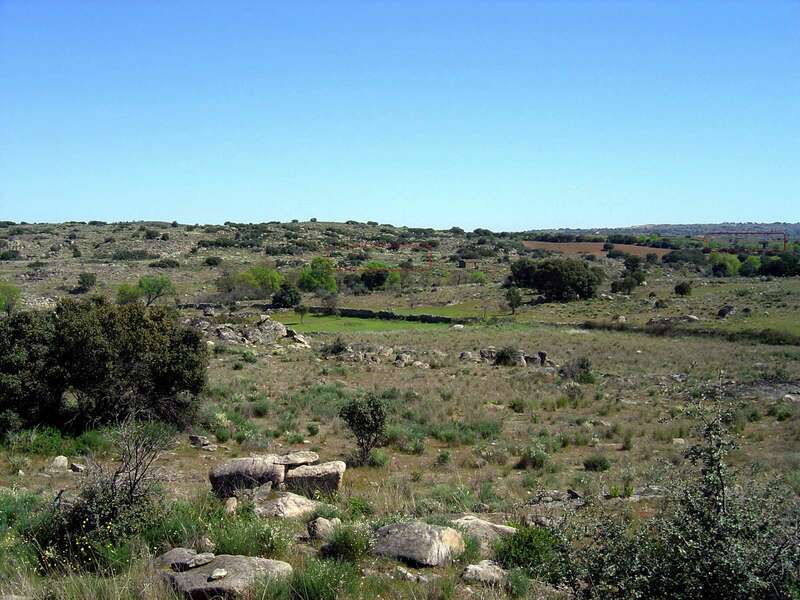 In both cases the existing soil is used similarly for olive groves and grass and weeds are removed regularly, both for reasons of agriculture and for the prevention of fires. In recent years the weeding has been done by mechanical means, but always without breaching depths below about 15-20 cm. 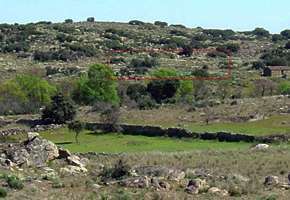 In relatively recent times, still in the memory of the owner, this whole area was also used for cereal production, and there are still visible in the area of Cardina II small retaining walls built to contain ploughed land in terraces. The red rectangles show the archaeological digs. Illustration of hunters observing horses and aurochs preparatory to hunting them, at Olga Grande. 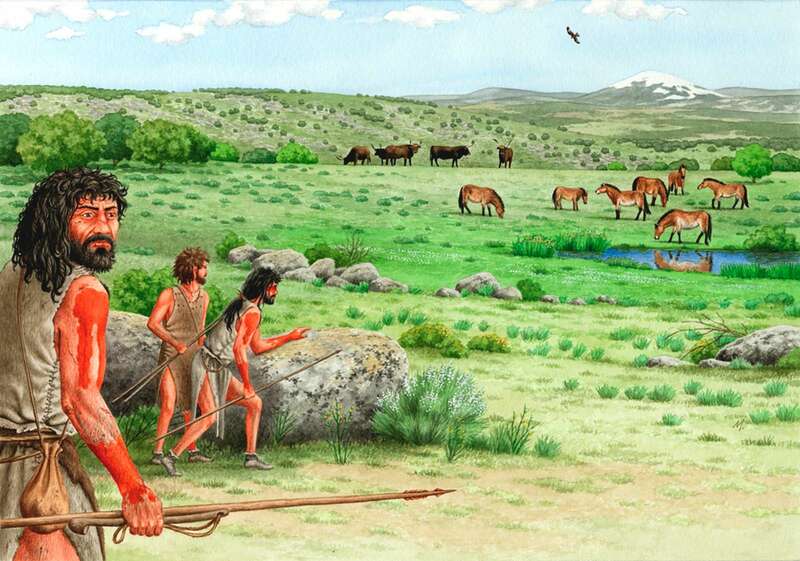 After a successful hunt, there is very little of the aurochs that is not used. The skin is stretched on a frame, and is prepared for further use. Sharp tools are always needed, and new ones must be prepared quickly and efficiently to replace those lost or dulled with use. The aurochs steaks look pretty good! A shouldered point from the Coa Valley, one which has been carefully made to accept the end of the haft of a spear to make binding the point onto the spear easier. The sharp end of this point has been broken off during use. 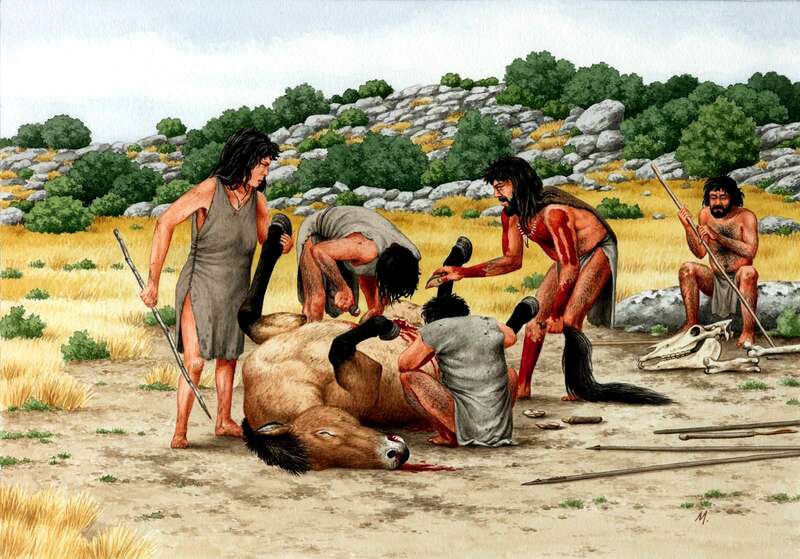 Illustration of the butchering of a horse in palaeolithic times in the Coa Valley, at Olga Grande. 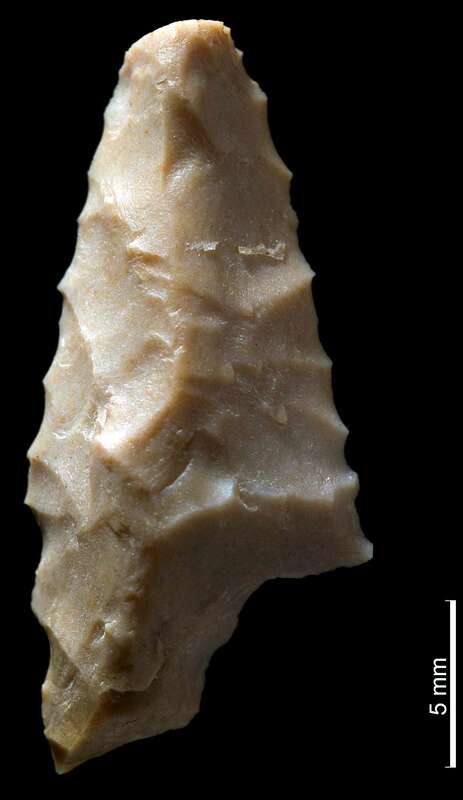 The site is littered with thousands of artefacts which attest to this use by the Palaeolithic inhabitants. There are many examples of horse engravings in the Coa Valley. 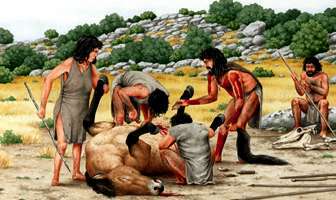 This photograph was set up to illustrate hunting in the Coa valley. 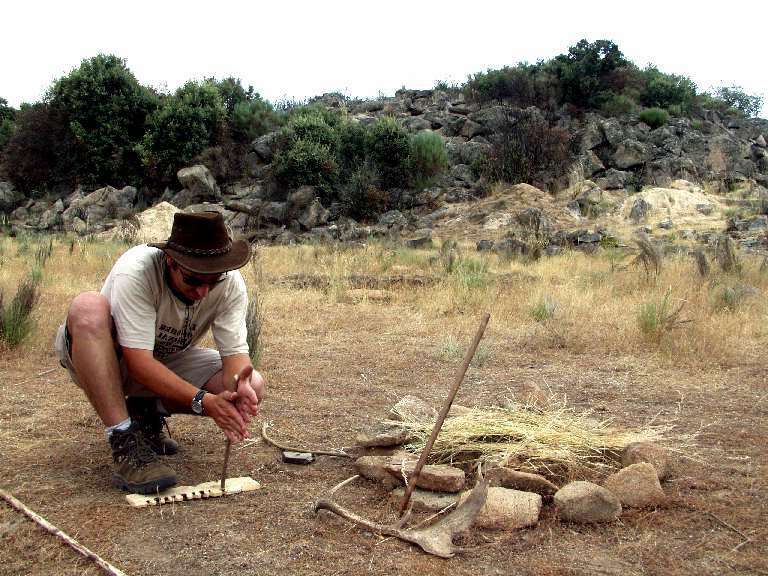 Volunteers have makeshift spears at the ready while hunting a "deer". 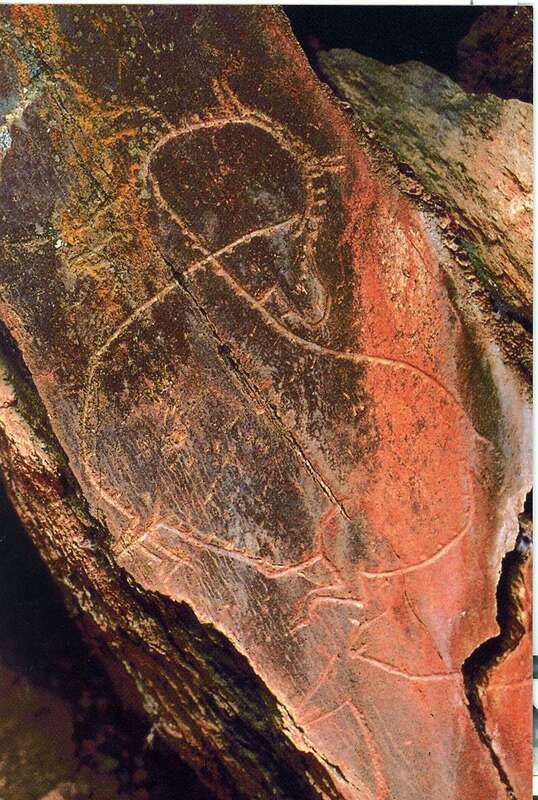 The species represented in the art of the Coa Valley are: Auroch (Bos primigenius), Horse (Equus cabalus), Elk (Cervus elaphus) and Spanish Ibex (Capra pyrenaica), there is also one fish (an unidentified species) and one human figure. These are some common snakes of Portugal, some of which no doubt lived in this area in Palaeolithic times. 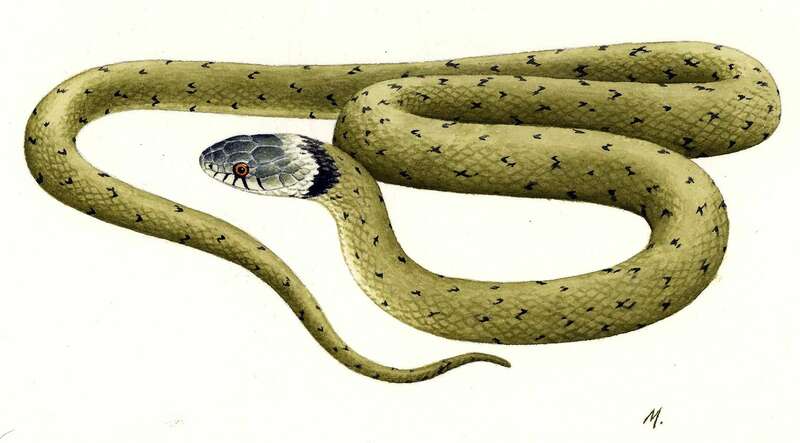 The Grass Snake (Natrix natrix) is the best known european snake. It is widespread throughout Europe and occurs from England to Russia, from Portugal to Finland. Only decades ago, this reptile was very common, especially in habitats associated with water. But in our days such natural habitats are rare, at least in congested urban areas. 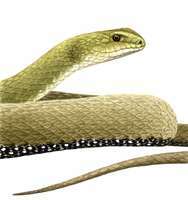 Grass snakes feed on amphibians, fish, small mammals and, to a lesser degree, on young birds. Mature females can be up to 200 cm long, but usually reach a length of 100 - 150 cm. The males are smaller. The typical characteristic of central european subspecies is the yellowish or white 'half-moon' on both sides of the neck. The body colouration is variable, most specimens are grey or olive green with dark spots or bars along their sides. Needless to say, N. natrix is harmless. 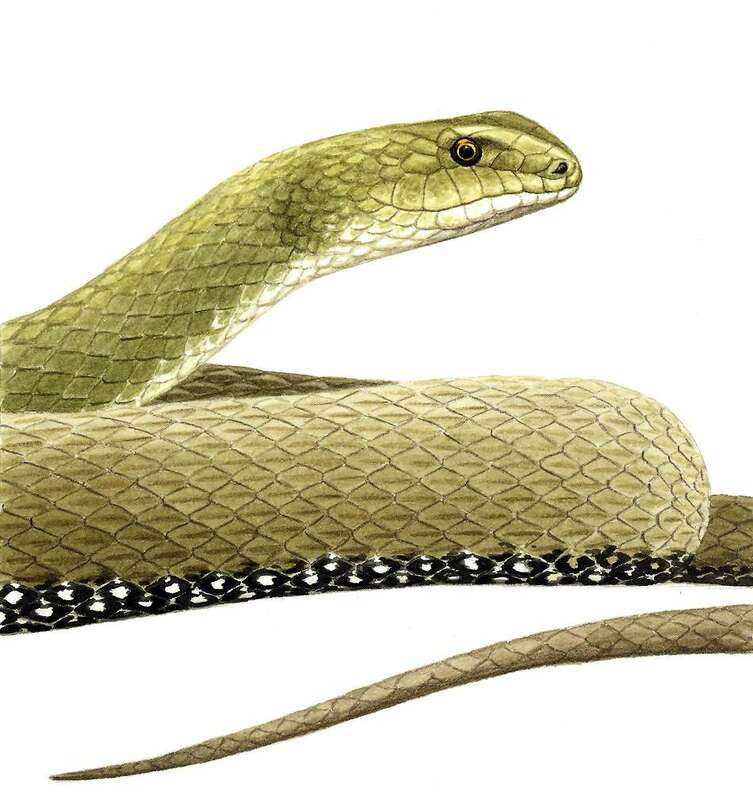 The Montepellier snake (Malpolon monspessulanus) is found from northern Italy to southern France, the Iberian peninsula and northwest Africa. This snake is rear-fanged with 2 enlarged teeth in the back of its mouth, from where poison can be injected to the bite. A normal bite from this snake is not harmful because of the position of these teeth, but the poison is potent and will cause swellings, pain and even fever for a couple of hours. 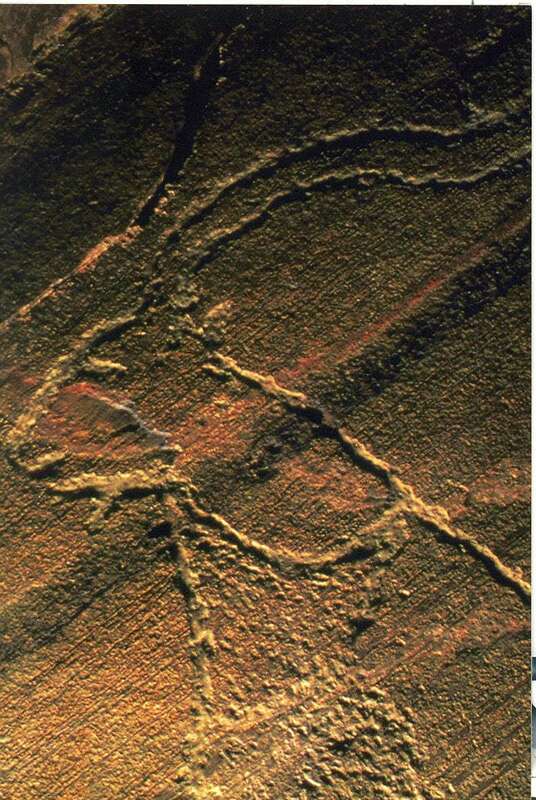 The Montepellier snake is up to 2 metres long, and animals above 150 cm are common. The nominate form has a blackish front body. 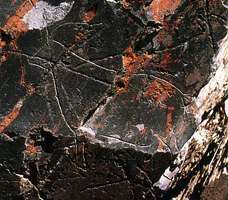 They are normally brown or green but even red, black or turkish-blue coloured forms are found. Juveniles are light coloured with darker saddles or spots on the back. They have a large head and large "eyebrows" making them look angry. 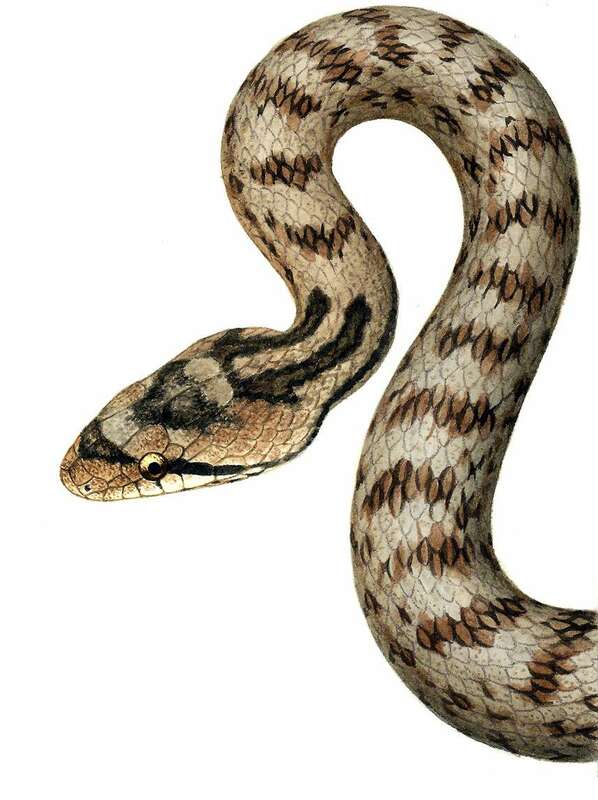 This snake is protected in Europe under the Berne Convention. The Southern Smooth Snake is small in size, with a small head and a relatively short tail. The back and sides are usually grey or brown in colour, with a transverse row of spots on the back. On the belly there are often dark square spots in a checkerboard design. 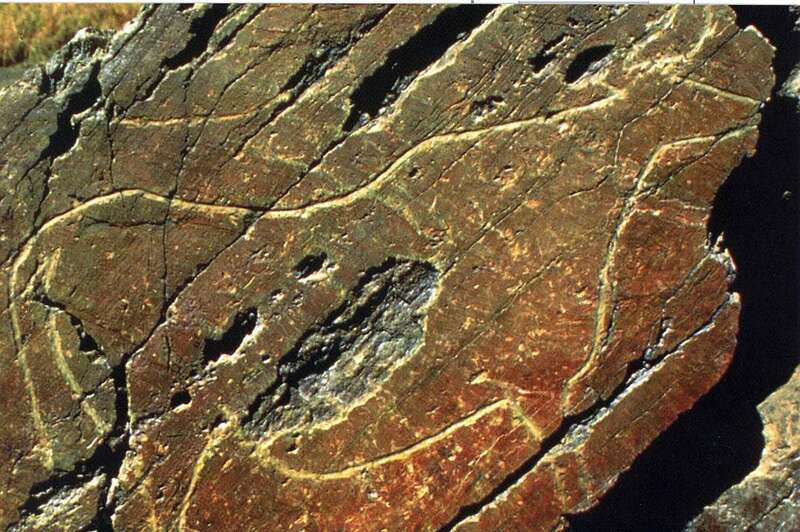 It is likely that the species arose in the Iberian peninsula. 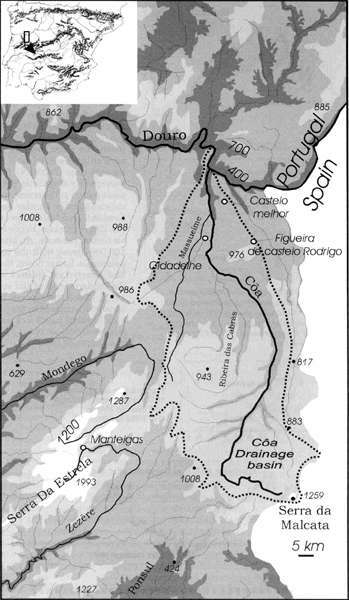 It is distributed across the Iberian peninsula, northwest Africa, and southwest Europe including southern France and northern and central Italy. Their main prey are lizards, including in their diet to a lesser extent eggs of reptiles, small mammals, birds and chickens. They are active at dusk looking for their prey. Coluber hippocrepis lives in the southwestern corner of Europe and the northwestern part of Africa. Maximum size is about 150 cm but adults are normally about 120 cm. It is one of the prettiest snakes of Europe, but especially the animals from Morrocco are very colourful. They normally prey on other reptiles, but will after a time in captivity accept rodents as food. These very active snakes prefer a hot and dry environment. Marcos Oliveira is a scientific illustrator who lives in Lisbon, Portugal. He has completed several valuable paintings of people in the Coa Valley in the Palaeolithic, which give a very good idea of what life in those times was like. Photo: Marcos Oliveira, from his website. More photographs of sites and venuses are always welcome! I do not keep back any higher resolution photos from my website. To obtain the highest resolution I have, you need to click the small image (thumbnail) on the web page, when the full, higher resolution image will appear on your screen, from which you can copy or download it. Thus, each small image is a link to the highest resolution of that image that I have available, and anyone can access it just by clicking on the thumbnail. Anyone (e.g. students, teachers, lecturers, libraries, writers of books, film/video makers, the general public) may use and reproduce, crop and alter the maps which I have drawn and photographs which I have made of objects and scenes at no charge, and without asking permission. If you decide to use one or more of my images, I would be grateful (though it is not necessary) if you would include a credit such as 'Photo: Don Hitchcock, donsmaps.com' or similar, at the place you normally put your credits. Obviously this does not apply for any rephotography I have made of existing photographs and diagrams from other people, in which case copyright remains with the original photographer or artist. Nor does it apply where there is some other weird copyright law which overrides my permission.